Nan and Greg Myer's home is so thoughtful and sophisticated, I know that I could never invite them into my own home. It's impeccable. 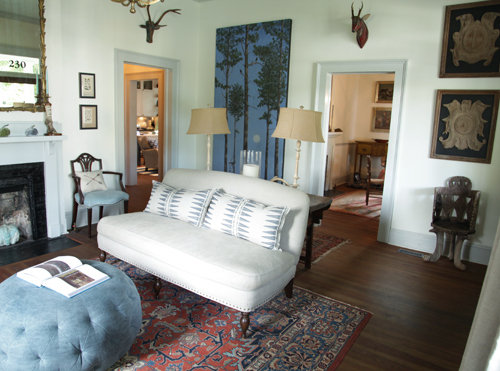 As Nan owns the fabulous shop, Firefly in Thomasville, Georgia, her great taste carries through in her lovely abode. When I asked Nan to describe her home style, she replied, "It's definitely reflective of the natural world with an eclectic mix of primitive Chinese antiques, Southern antiques, art and hand me downs." She continued, "Everything has a story, whether it be the pottery that we eat on, the chair that we sit in or the soap that we bathe in." Their expansive and inviting kitchen is my favorite room in the house. Nan, "It is definitely the heart of our home and I love the combination of the kitchen and den as one great room." You'll quickly notice the faux taxidermy above. Nan and Greg have 11 Java Deer that are native to the islands of Java, Bali and Timor in Indonesia. It's a symbol of protection in Bali and these now stand guard in the Myers household. Eyes are also quickly drawn to the framed art above the fireplace. Nan bought this piece that showcases dozens of found arrowheads at Brunk's, an auction house in North Carolina. She believes the arrowhead collection is native to North Carolina as well. Nan, "We grew up with a father who avidly collected arrowheads from our neck of the woods, so I come about my fascination with them quite naturally." I particularly love the beautiful tree painting that was a wedding present to Nan and Greg from their friend, John Cleaveland of Farmington, Georgia. (I think I'll need to blog about him soon.) The living room couch is from Lee Industries. Their bedroom has an immediate calming vibe which is inspiring. Nan, "I love the wall color and have used it in a couple bedrooms and unfortunately it is a Benjamin Moore mix or I would share. It is the perfect pale gray, green, blue and is very neutral." All the elements in the bedroom are purposefully subdued. The gorgeous headboard is an Indian block print and white Tai Chi Chinese fabric covers their slipper chair (which once belonged to Nan's grandmother). The bedside lights come via Robert Ogden. Nan and Greg's dog, Bleu, grabs a glimpse outside. But he's pretty content to be inside...I would be too.